Homeowners in Balmoral, New South Wales were concerned that they were going to ruin their beautiful sandstone since it required consistent cleaning. They feared that regular power washing would wear away the surface of the stone. The total surface treated was about 240 square meters including the pool surrounds, patio, walkways, wall, and stairs. Click here to view the full case study or download the PDF. Fall is rapidly approaching and soon while we are indulging in caramel apples and the beautiful foliage, our porous stone patios and walkways will become covered in leaves. This presents a serious staining problem if the fallen leaves are left on the stone for too long, especially if the stone isn’t sealed with Dry-Treat’s Stain-Proof. There are two materials within a leaf that can cause staining, one being the sap leaves produce which can be a sticky, gum-like substance that is very hard to remove from porous material. Another problem is the tannins inside the leaves. According to the USDA’s Forest Service, tannins are complex substances derived from phenolic acids. They are classified as phenolic compounds, which are found in many species of plants, from all climates and all parts of the world. Tannins are large molecules that bid readily with proteins, cellulose, starches, and minerals. These resulting substances are insoluble and resistant to decomposition. Due to their resistance to decomposition, this can make cleaning or removing leaf stains a nightmare. In this case prevention is more effective than treatment, however we do have a solution. Oxy-Klenza™ is an odorless, powerful triple action, oxygen, alkaline and detergent boosted heavy duty cleaner for removal of general grime and stains. Safe for all natural stone, tile, masonry, concrete, grout, vinyl and raw/unfinished wood. 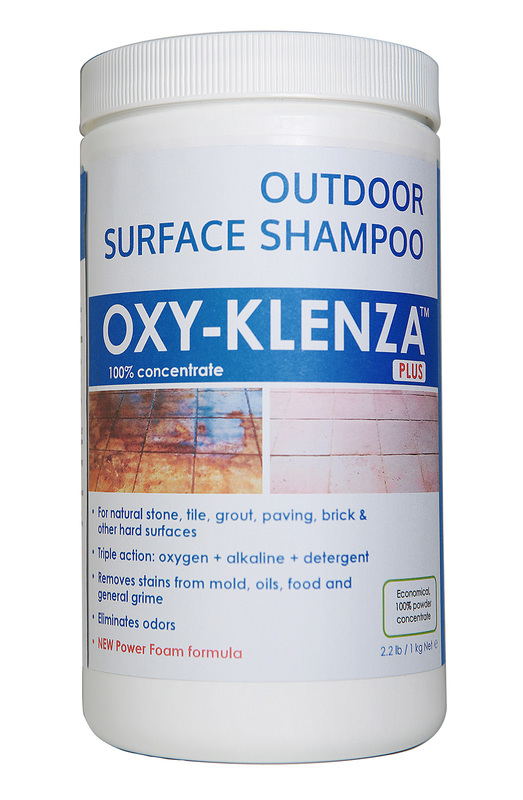 Oxy-Klenza™ is 100% concentrate, environmentally responsible and safer to use than traditional heavy duty cleaners. Oxy-Klenza™can also be mixed into a paste with a little water and used to create a poultice to hold the cleaning agent in prolonged contact with the affected area to draw out and remove deep stains. For more information on how to use Oxy-Klenza™ visit our website. LANDSCAPE is the UK's leading trade event dedicated to products, services and innovation for the design, build and management of exterior and interior landscape projects. LANDSCAPE is established as the essential trade event for discerning landscape designers, architects, contractors, facilities managers and interior designers involved in some of the most important, prestigious and valuable projects in the UK and beyond. For preregistration follow this link to the show website.